Apple Dividend: Is a Big Increase Coming Soon? With its stock price on the rise, the tech titan may put more emphasis on dividend growth when it updates its capital return program next month. Five years ago today, Apple (NASDAQ:AAPL) announced plans to start paying a dividend for the first time since 1995. Since then, Apple has raised its dividend at a steady but relatively modest pace. Meanwhile, Apple's original $10 billion share repurchase plan (announced at the same time) has morphed into a massive $175 billion share buyback program over the past few years. Apple will announce the latest update to its capital return program next month in conjunction with its Q2 earnings report. This time around, the iPhone maker may finally start to raise its dividend at a faster pace. Apple paid the first dividend under its current capital return program in August 2012. At that time, the quarterly payout was $2.65 per share. Adjusting for Apple's 2014 stock split, this translates to a dividend of about $0.38 per share. Each April since then, Apple has raised its dividend. The biggest increase came in 2013, when Apple raised its dividend by 15%. The smallest increase (8%) came the following year. The average annual increase has been about 11%. Apple restarted its dividend in 2012. It has been growing ever since. Image source: Apple. In total, Apple's payout has grown by about 50% during this period. For the past year, its quarterly dividend has been $0.57 per share. Common metrics of dividend safety indicate that Apple could afford to pay a lot more to its shareholders. It currently has a payout ratio of just 27% based on its earnings over the past year. A payout ratio twice as high would still be considered safe by most experts. Many investors prefer to measure dividend safety by looking at free cash flow. After all, if a company is not generating enough free cash flow to cover its dividend, then it has to issue debt or stock to plug the gap. Apple is in good shape from this perspective as well. The company generated more than $52 billion of free cash flow last year, while its current quarterly dividend of $0.57 per share works out to about $12.5 billion per year for dividend payments. There are two main reasons why Apple should consider a bigger dividend increase than has been its recent custom. 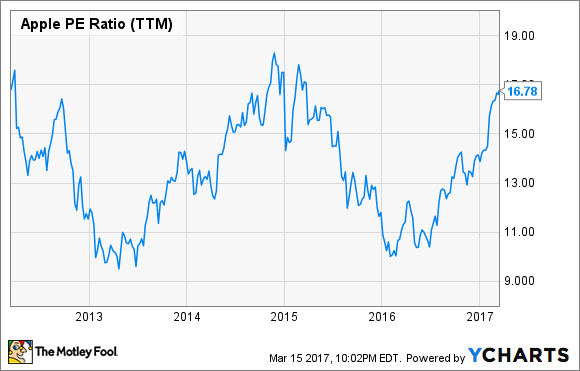 First, Apple's dividend yield has fallen significantly since the April 2016 update to its capital return program. When Apple raised its dividend last April, the new $0.57 per share quarterly payment worked out to a 2.2% annual yield. Now, thanks to Apple's surging share price, the dividend yield has fallen to just 1.6%. Second, with Apple stock recently reaching a record high of $140, share buybacks seem less attractive than they have been for most of the past five years. Apple's earnings multiple is near the high end of its recent historical range, which suggests that the stock is not a huge bargain right now. Apple P/E Ratio (TTM) data by YCharts. Dividends and share repurchases are just two alternative ways to return cash to shareholders. As a result, if buybacks are generating diminishing returns due to Apple's rising stock price, it might make sense to shift the capital return program's emphasis toward dividends. Since Apple restarted its dividend in late 2012, its dividend yield has averaged about 2%. Just to get back to a 2% yield, the quarterly payout would have to rise 23% to $0.70 per share, based on Apple's recent stock price. There's a good chance that Apple will announce a dividend increase of roughly this magnitude next month. In the past year or so, Apple's management has placed an increasing amount of emphasis on the company's services segment. One of the big strengths of the services business is that it generates reliable recurring revenue, whereas device sales fluctuate due to product cycles. If Apple's cash flow is set to become more predictable in the future, then the company should start to behave more like other cash-cow businesses. That starts with offering a significantly bigger dividend.